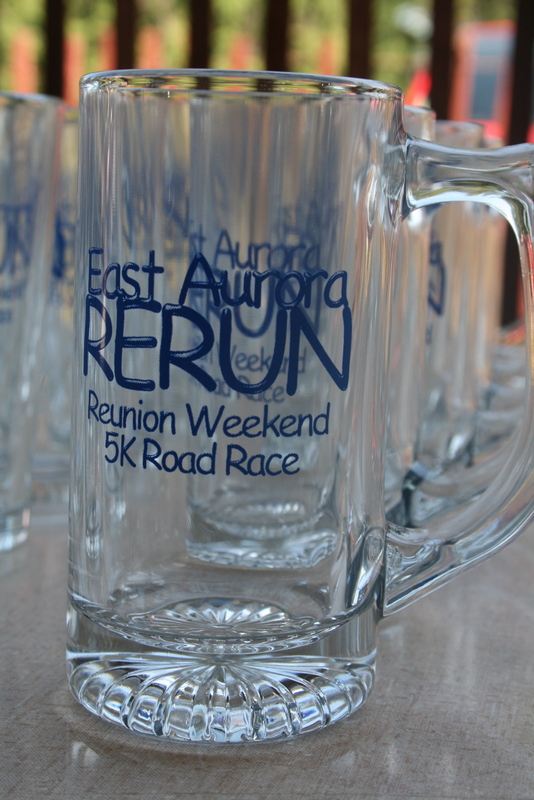 It’s Reunion Weekend here in East Aurora. 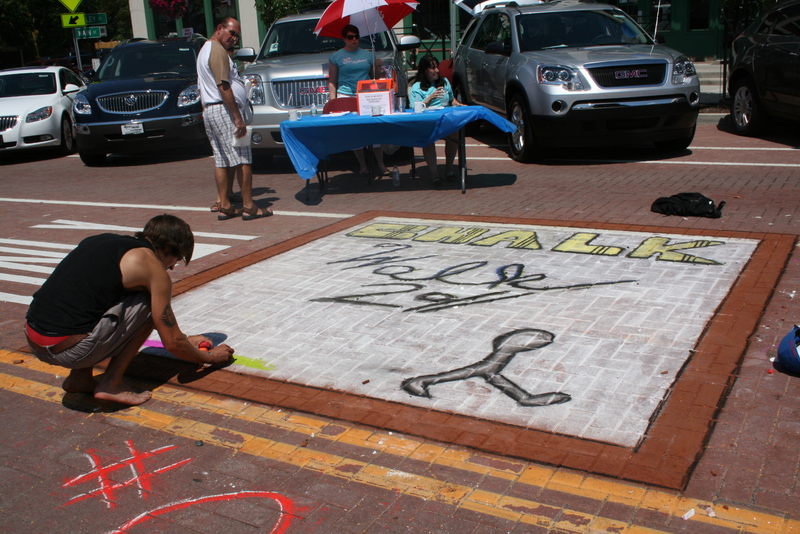 That means the 5K, sidewalk chalk competition and sale and, of course, all the high school reunions. Andrew’s is tonight at a local bar, Wallenwein’s Hotel. Hi Bob! 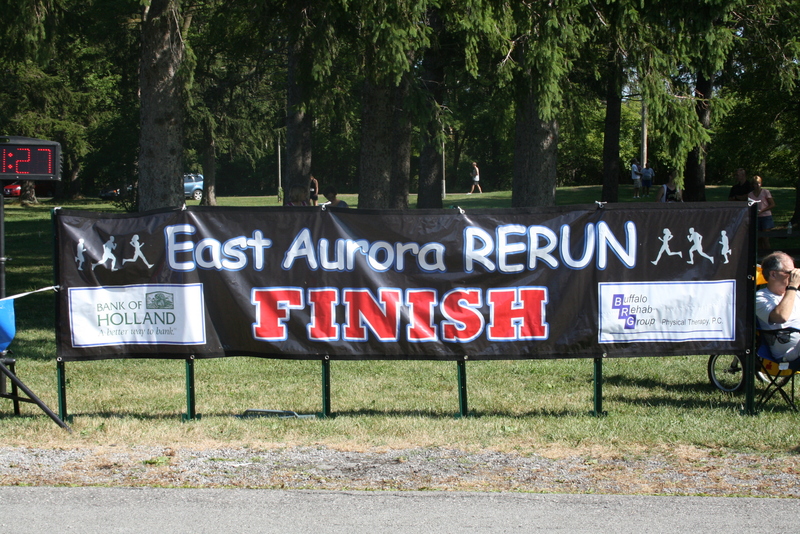 We started our day off with the RERUN 5K at Fireman’s Field. 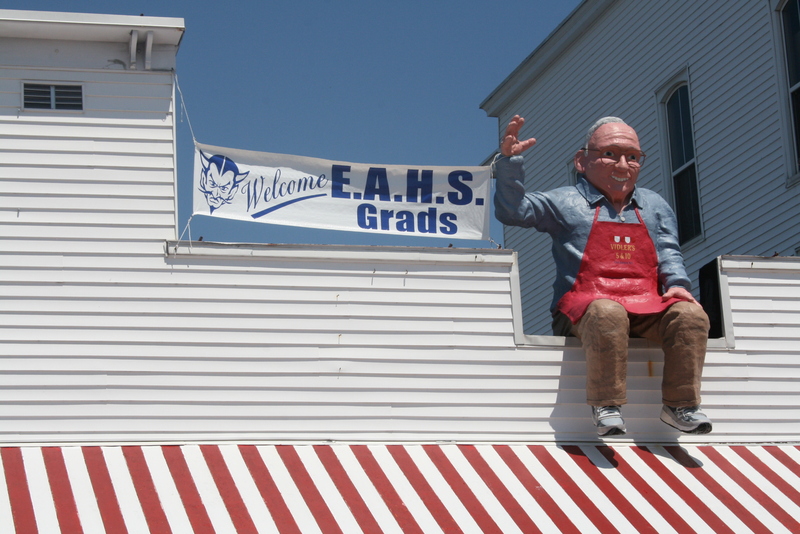 It was the first time I’d been there, so it was neat to get acquainted with another part of the village. Andrew ran with me–yay! Well, “with” might be slightly misleading. More like 3:33 minutes behind. He threw his water at me. I LOVE just-ripe bananas! And the Braeburn apples. Did you know New York used to be the apple capital of the country, if not the world? Apparently Washington has overtaken NY’s production. Oh well, more for us! 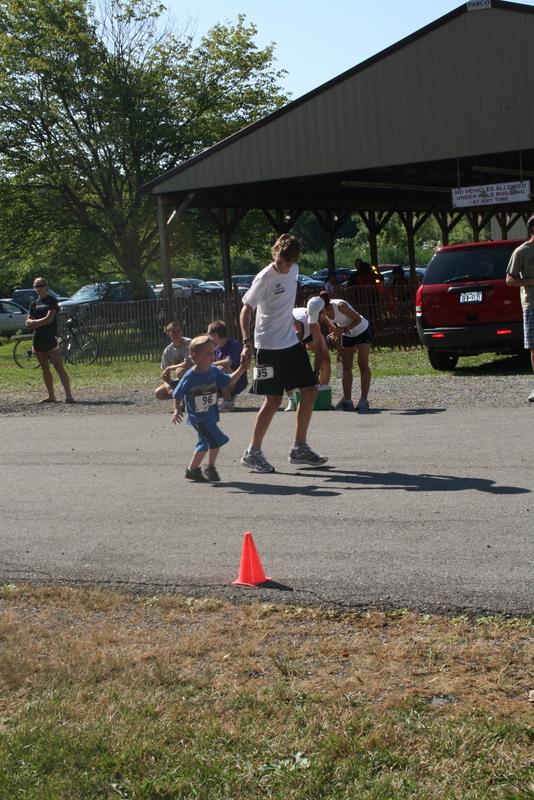 There was also a one-mile kids’ fun run. Adorable. Guess what?! 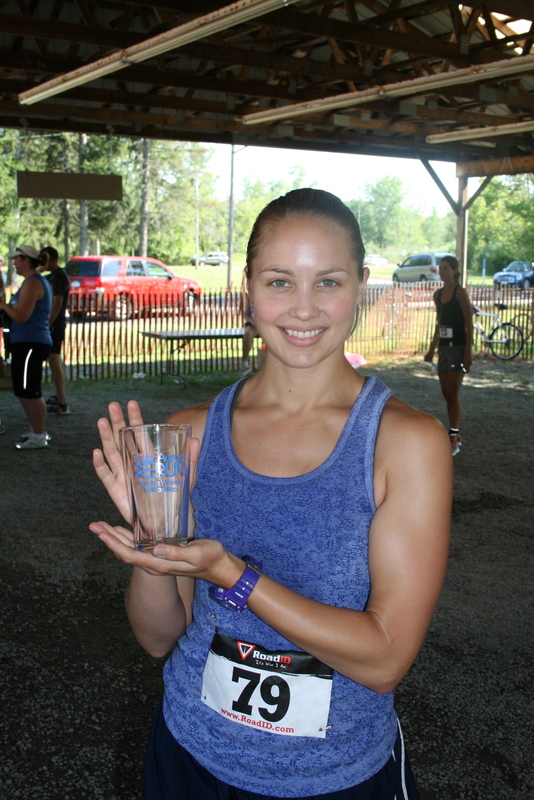 I won my age group! HOLY COW! 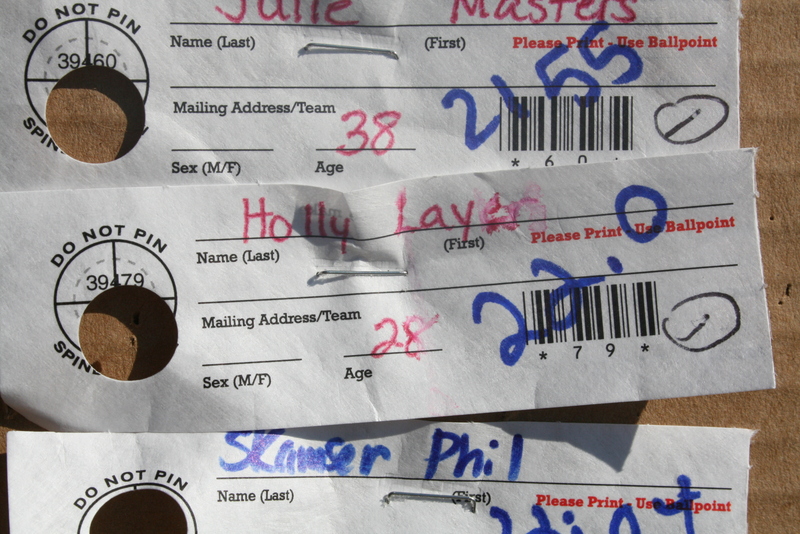 This was a shocker, since despite the small size of the field, it was FULL of “real” runners. Not that I’m NOT a runner, but you know what I’m talking about. 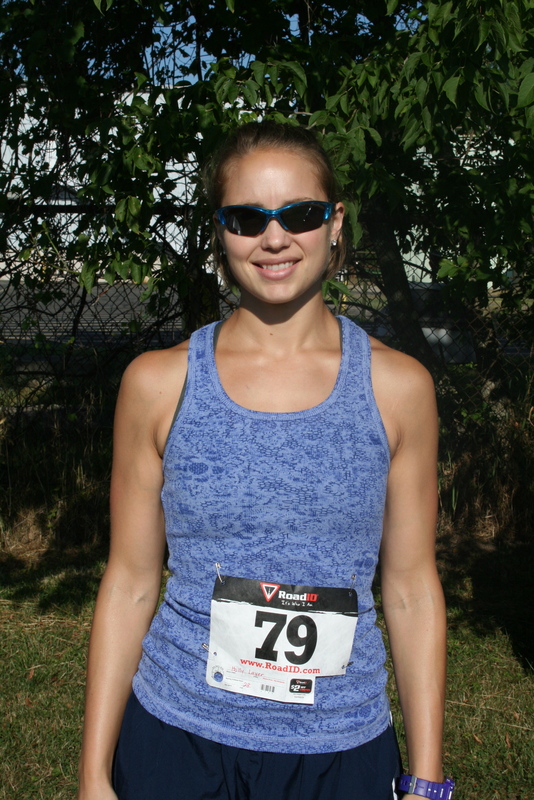 Teeny sports bras and compression shorts abounded. 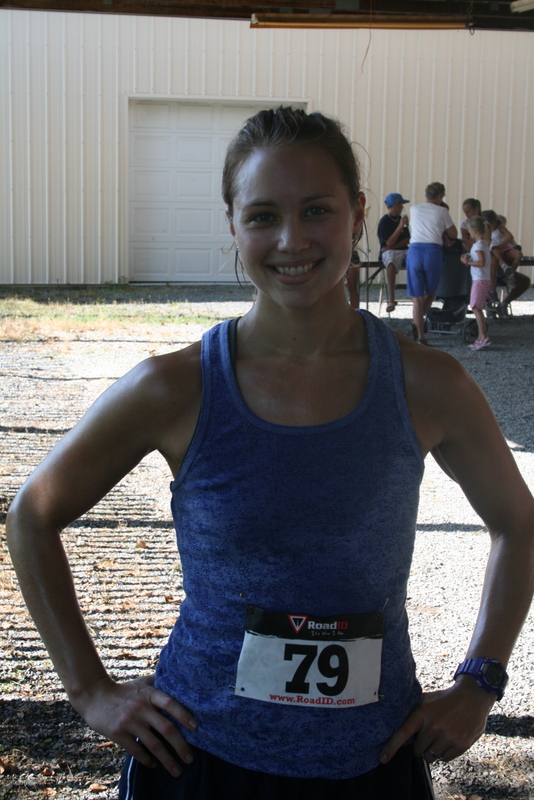 The overall female winner (with an 18-something time) is a college runner at Bucknell. 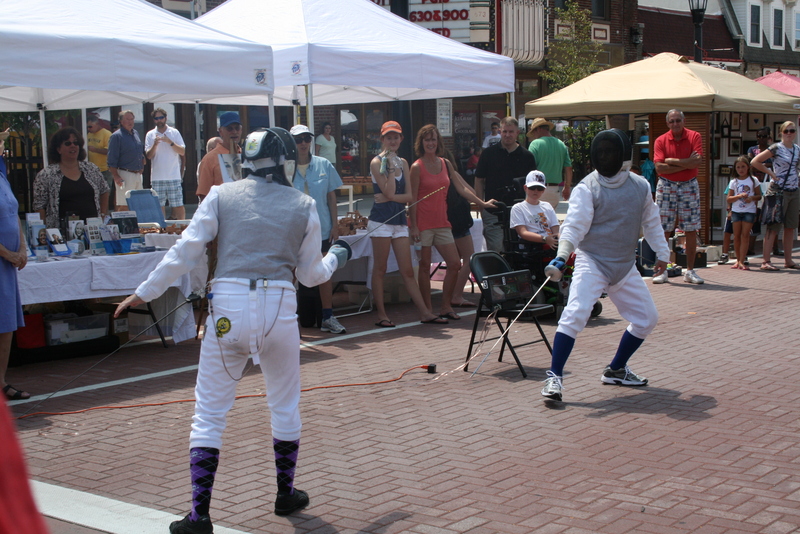 At least five or six youngsters (16-20 year-olds) smoked me. 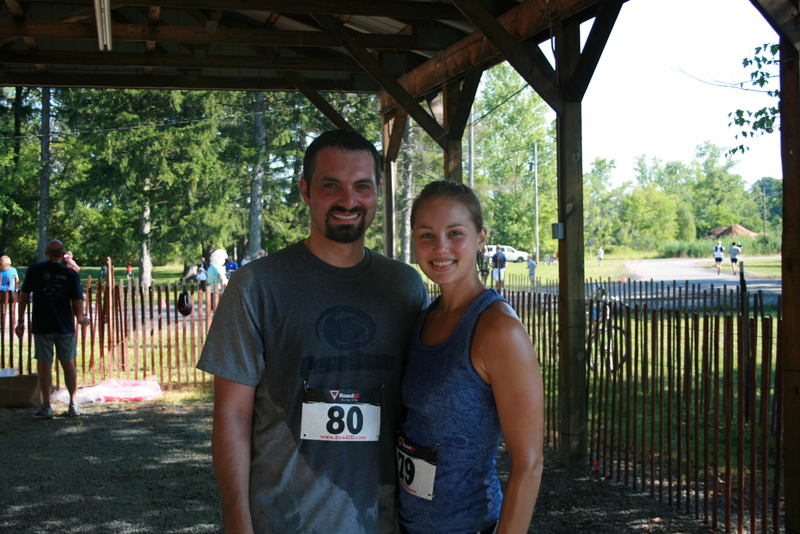 I ran the 5K in 22 minutes flat, which is definitely my best time ever. So proud! The awards were pint glasses and beer mugs. I chose the pint because I love the size and collecting those with neat designs. I picked up a couple colorful ones recently that are teal and brown and say “Buffalo Lounge.” I can’t wait to use them in our future house. Check it out! 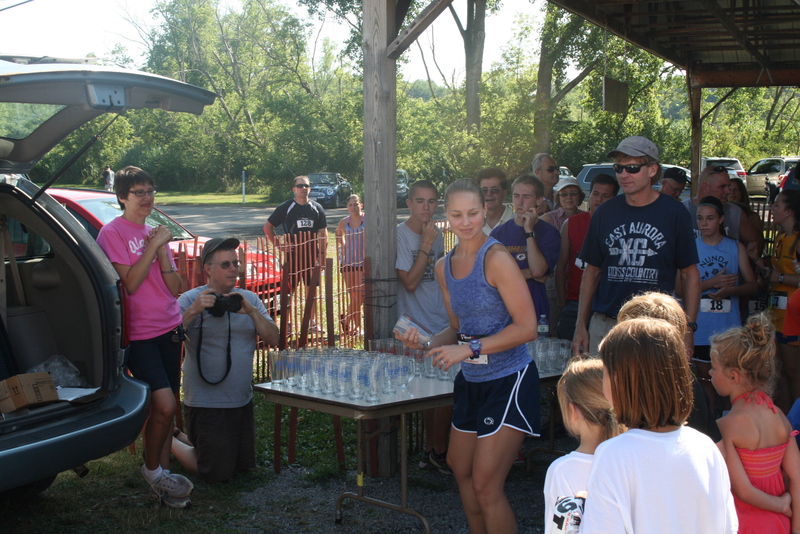 Andrew’s high school track and cross country coach was the one handing out the awards–neat! I’ve come so far as a runner from where I was in college; it’s hard not to be just ecstatic. After the run we popped by the co-op. Alix Martin and her team had started the mural project earlier this morning and I was supposed to take some photos of the progress. I’ll link to that once it’s finished so you all can see! We cleaned up at Andrew’s parents’ house, then headed over to Main Street for the sidewalk sale. 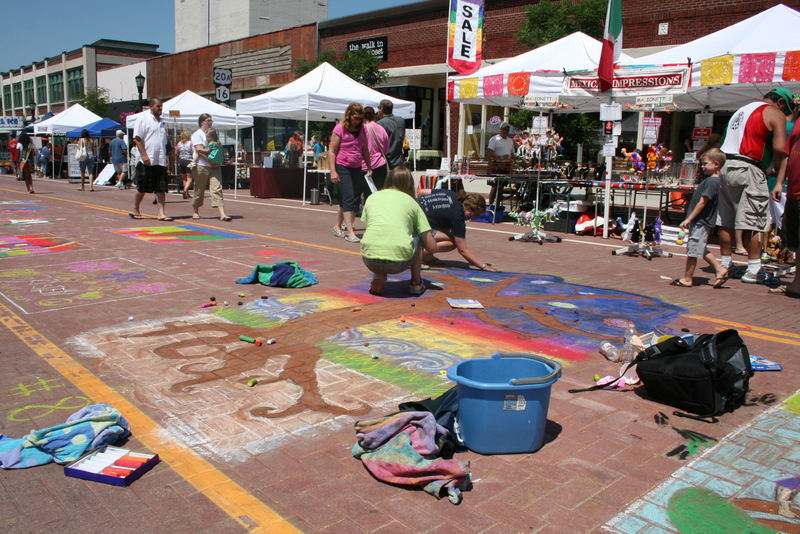 It’s an annual thing and all the shops along Main Street bring out their wares, as well as typical fair booths and festival food. 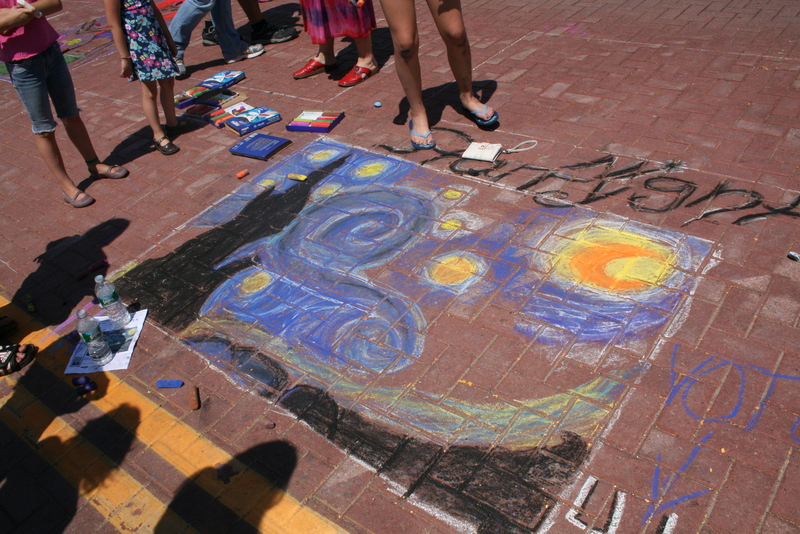 Kids hard at work on the piece that, I believe, took second place. 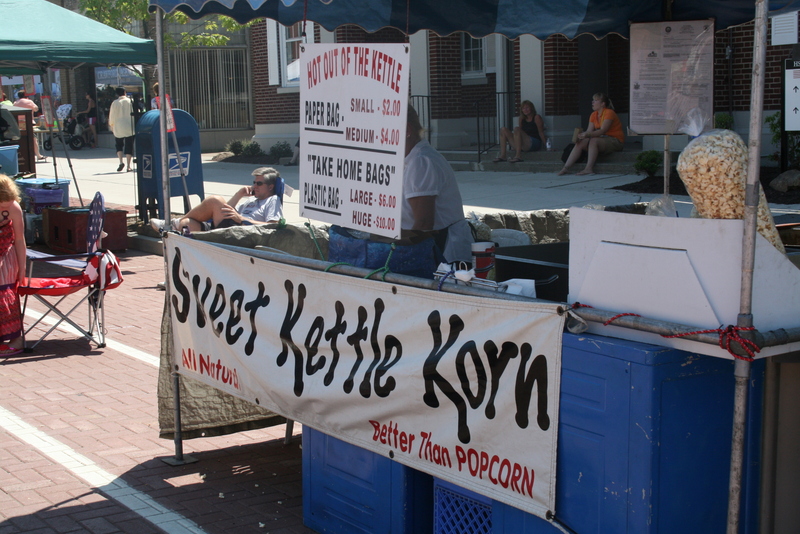 What fair would be complete without kettle corn? 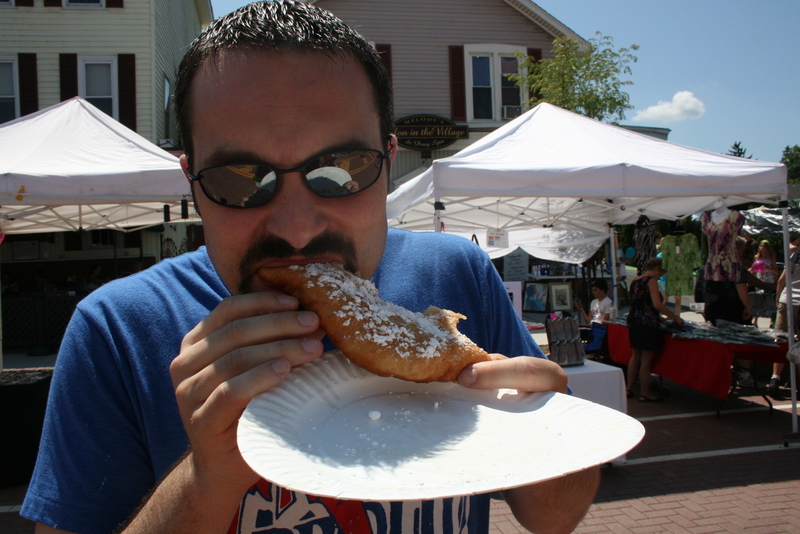 …FUNNEL CAKE! I was full of self-control and only had two bites. It was pretty steamy out (even I was getting warm! 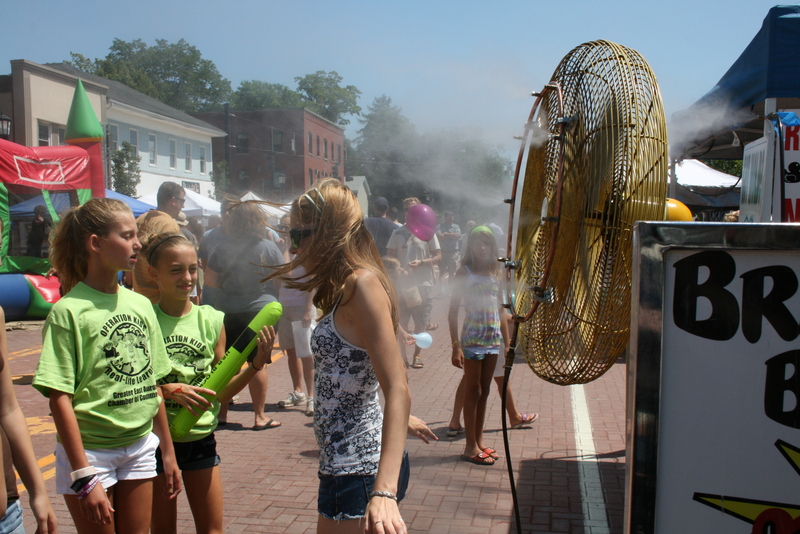 ), so the mister was a hit with those who didn’t mind getting a little wet. 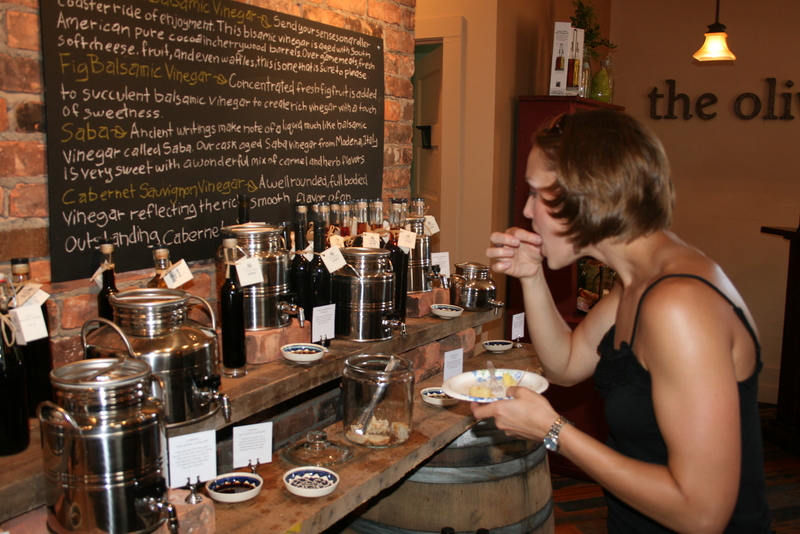 We took a break from the heat and headed into Tuscany on Main, the newest olive oil and vinegar store in town. They were having tastings and we loved it. We’ll definitely go back. I tried fig, chocolate, blood orange and cherry balsamic vinegars, pear champagne vinegar and garlic olive oil. DELICIOUSNESS! 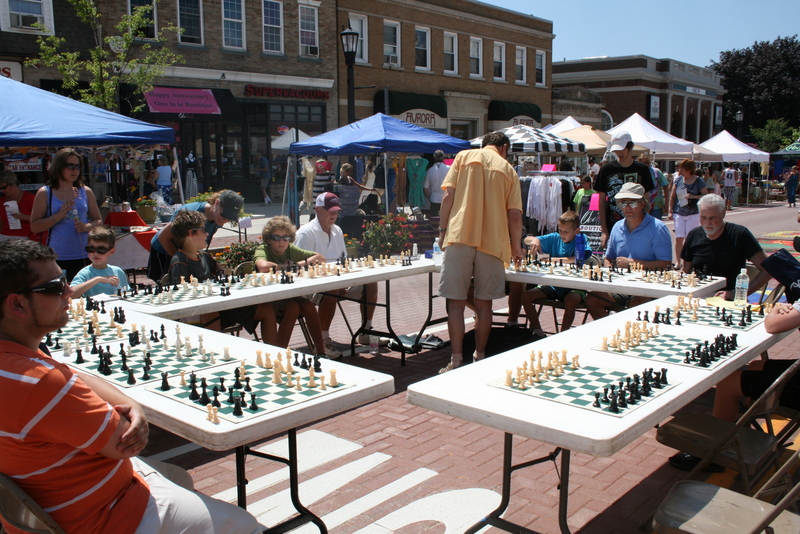 …and chess demonstrations, just to name a few. 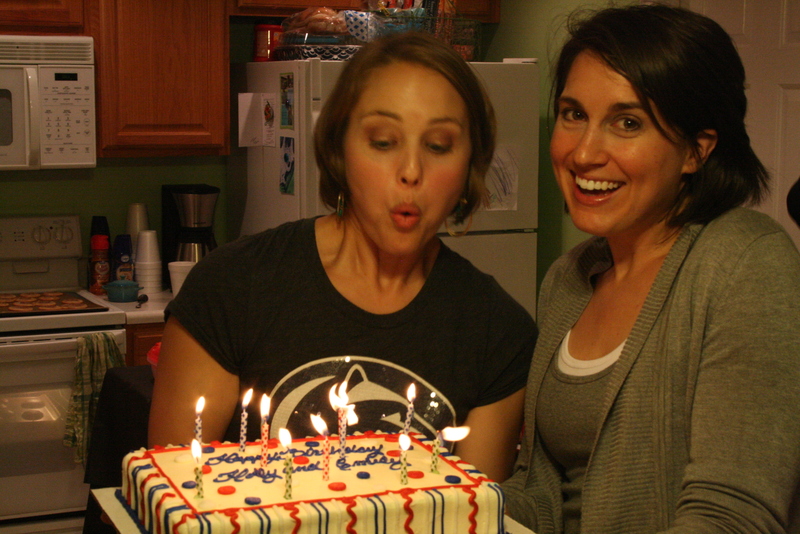 We’re headed out in a few minutes for Andrew’s reunion–must go get ready! …at least according to Andrew. That’s what he says when I make something new (which is pretty much any time I cook) and he likes it. DINNER! Photo courtesy of Andrew. 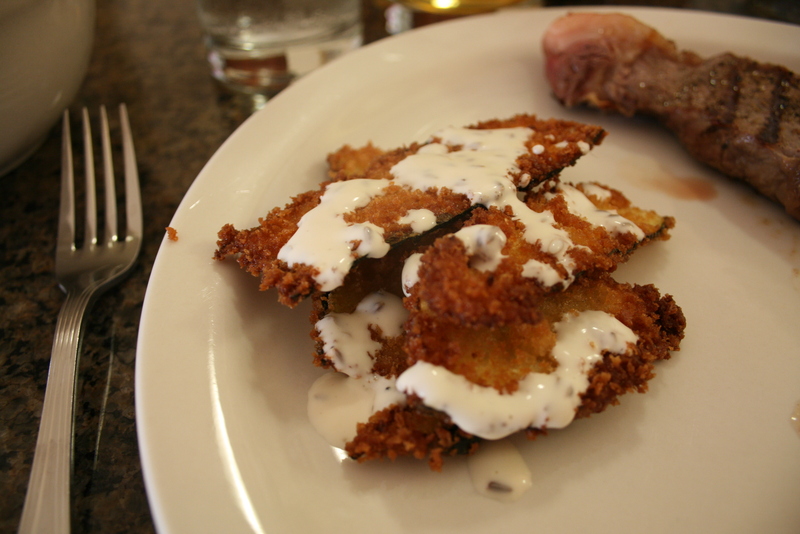 I made a version of Maggiano’s famous fried zucchini appetizer. It comes with lemon aioli and Susy and I could have eaten it 24/7 without stopping. Seriously. I found the recipe online at TaraCooks.com. I chose it because it called for club soda in the batter instead of an egg. I was out of eggs and I didn’t want to buy a whole dozen before my five-day trip to Phoenix. Besides, I’d rather get my eggs from the farmer’s market or the co-op, and neither of those happen until tomorrow, which did me no good tonight. 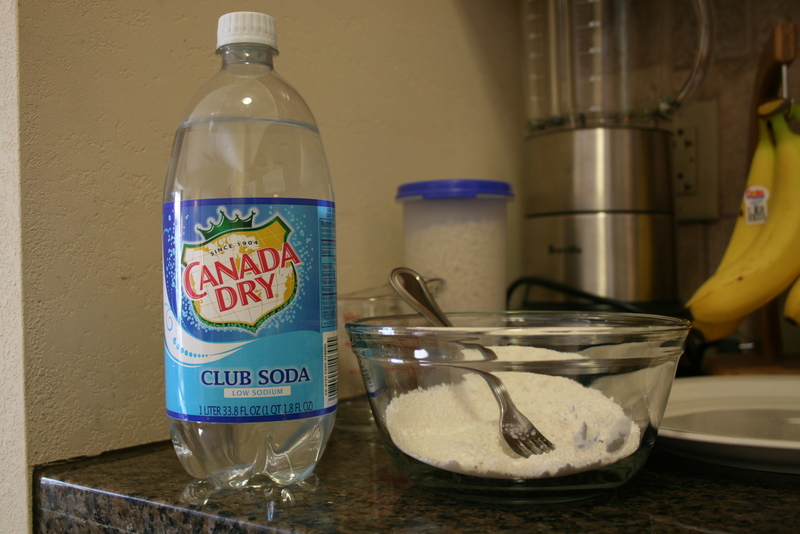 So, club soda it was. And it was 99 cents. And it doesn’t go bad. Sweet. 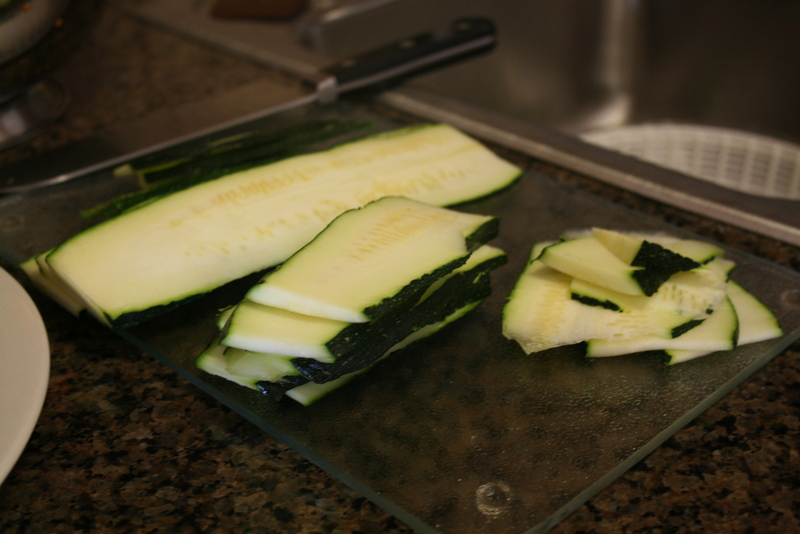 My cut-up zucchini was pitiful. The skin was super thick and my knife is dull as all get out (with no way to sharpen it here! ), so I wasn’t thrilled with the slices. I got a few long ones, but they were all too thick, and then a bunch of smaller scraps. Interestingly enough, the scraps turned out to be the best of the finished product. BTW, I HATE glass cutting boards. I hate the noise my knife makes each time I use it, and I swear it has contributed to how dull it’s gotten. But, it’s what’s here. I made the aioli, but not exactly as the recipe said. I subbed plain lowfat yogurt for the sour cream (it’s what I had in the fridge) and dill seed for the dill weed. I’m pretty limited here. It was yummy; more yogurt-y than creamy. Our salad fixings were on their last legs in the fridge, so I threw a basic green salad together for both of us with Garlic Expressions dressing. Andrew loves it! I love sprouts. 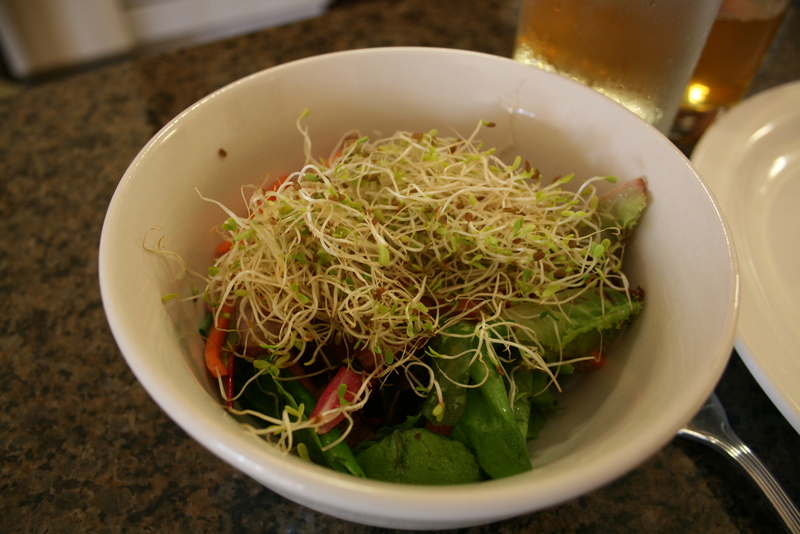 I especially love sprouts with ranch dressing or on veggie sandwiches with avocado. 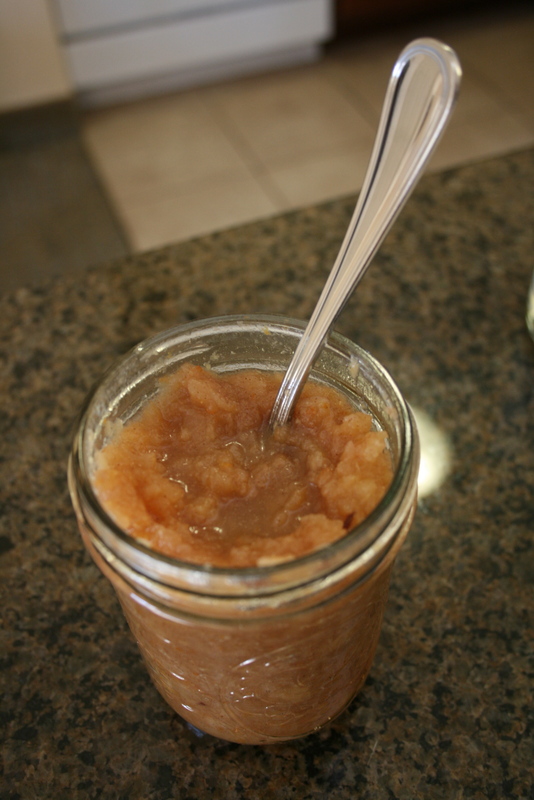 I also included some of my canned goodies: Barefoot Contessa’s Roasted Apple and Pear Sauce, from her newest cookbook, How Easy is That? I love this stuff. It’s like dessert. I canned a bunch for Christmas gifts this past year and it was my go-to dish to bring to events since it made so much and was so easy. I love that it’s applesauce with a more intense flavor, which comes from the pears and orange zest. To drink? 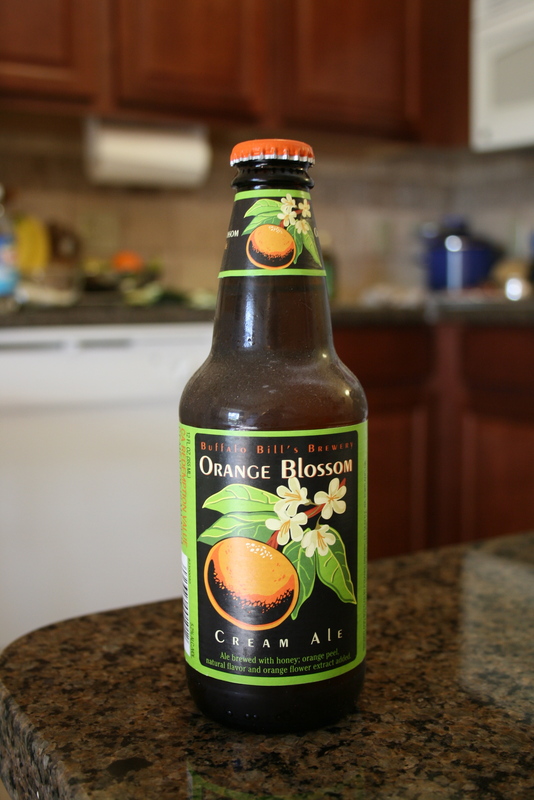 Buffalo Bill’s Brewery Orange Blossom Cream Ale. You can get this all over (in fact, the first time I saw it was in a friend’s fridge back in Ohio), but I’m on a ‘local’ kick and only want to buy New York microbrews right now. This is an awesome beer for those of us who like Blue Moon and won’t touch a Bud. For the sake of calories, Andrew and I have been splitting a beer instead of having our own. Obviously, there are lots of benefits to this; our purchases go further and we ingest fewer calories and alcohol. Since I’ve lost weight, I’ve definitely noticed that anything I drink affects me a lot more than before. Who knew ten-plus pounds could do that? Drinking just portions of beers, or wine, is something I saw on KERF. She’s always having just a little bit of something. 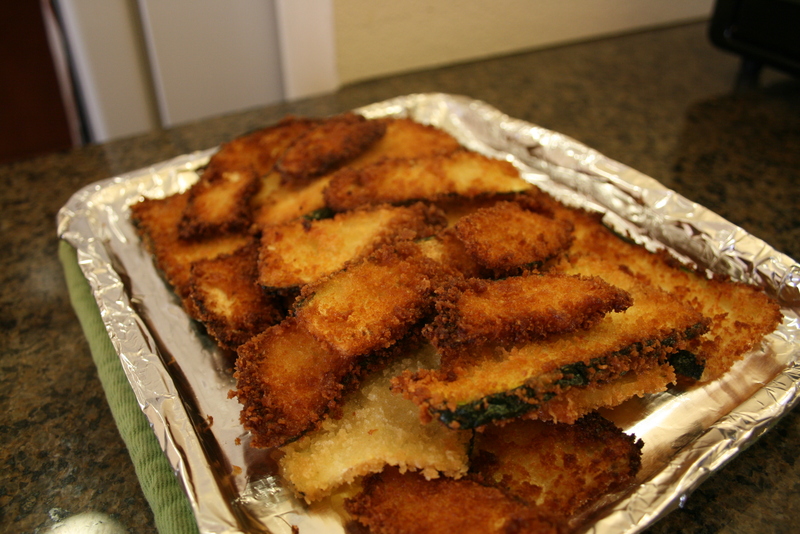 I fried up the zucchini and then kept it warm in the toaster oven. It was no Maggiano’s, but it was a great way to use a zucchini that was languishing in the fridge. Andrew, while he passed on the aioli, chowed the zucchini. Seriously. Thank goodness, because I probably would have it he hadn’t! What you see above, plus one long piece, is all I had–talk about some self-control! This post is for Emily, my sweet, sweet “Irish-twin-one-year-removed” who is a kindred spirit in terms of body type and is on her own “healthy weight” journey. She is one of the healthiest people I know, both mentally and physically, and I love her to death! Anyway, I found I had some extra time this afternoon due to crummy weather, which is postponing the awesome mural project at the co-op–the first thing I was going to help with as a volunteer. I’ll be working in a writing/blogging/photographing/PR capacity for them, which I’m super excited about since it’s right up my alley in terms of my education and strengths. Yay for God leading me right here, right now and blessing me with an opportunity to use my talents for something I truly believe in! OK, enough of that tangent. Back to lunch. Emily emailed me yesterday with some food questions, like how to feel more full and what other healthy things could she try to get more variety in her diet. I’m telling you, I missed my calling as a nutritionist. Seriously. Not that I necessarily want to work in a school/hospital/gym, but I want to KNOW that stuff. Hmm… I wonder if Andrew would let me just be a perpetual student so I could become a nutritionist/cook/baker/yoga instructor…? I replied to Emily and told her what works for me, as well as some sample snacks and lunches she could try to incorporate. Bottom line: protein really keeps me feeling full, and whole grains satisfy me. 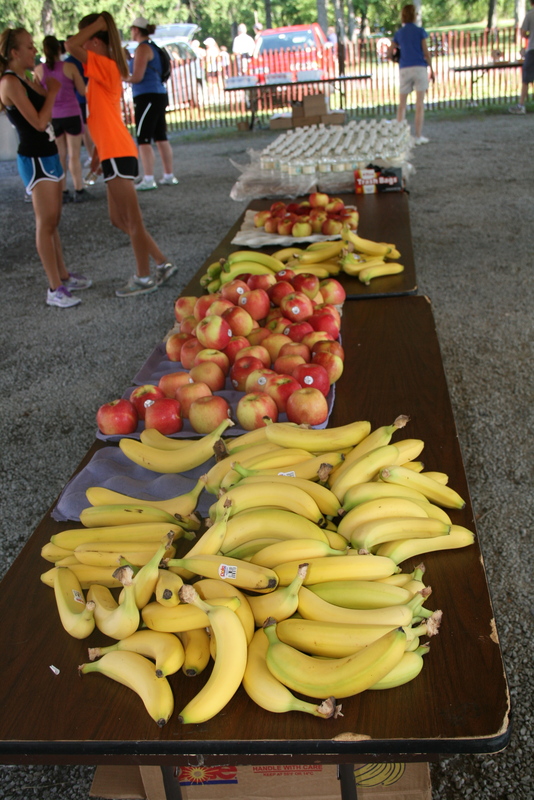 Add fruits and veggies to the mix and you’re set! The photos are nothing to write home about. I know. Homemade tuna salad. 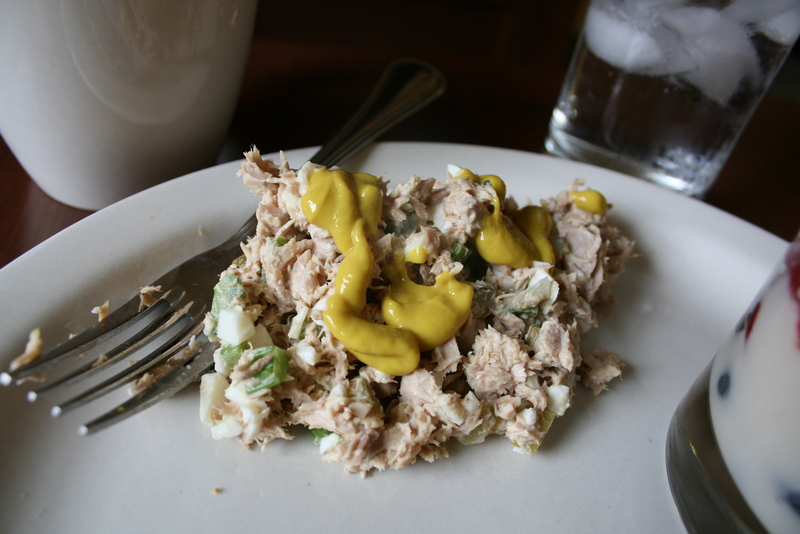 Tuna is a GREAT nutritional powerhouse, but you’ve got to keep the mayo in check. I almost never order it at restaurants because it’s just dripping in mayo. I made this two-serving batch with one hard-boiled egg white, some pickle and celery, 1.5 tbsp mayo and a teaspoon or two of mustard. I added a bit more mustard on top today. I also had a serving, and I mean ONE serving, of garlic parmesan pretzel crisps. I don’t usually eat a lot of pre-packaged things, but these were one of two bags Andrew picked up on our Target date and they are awesome. At 110 calories for a one-ounce serving, they’re better than chips and they were perfect for scooping my tuna. And measure! I have a tiny “diet” scale that’s perfect for measuring up to one pound. It really comes in handy for things like chips–have the chips, just don’t have three or four servings. For sweetness and protein, I recreated my “dessert” from last night: fruit and Kefir. LOVE IT. A serving is one cup, which has 140 calories, but I rarely have that much Kefir in one sitting. 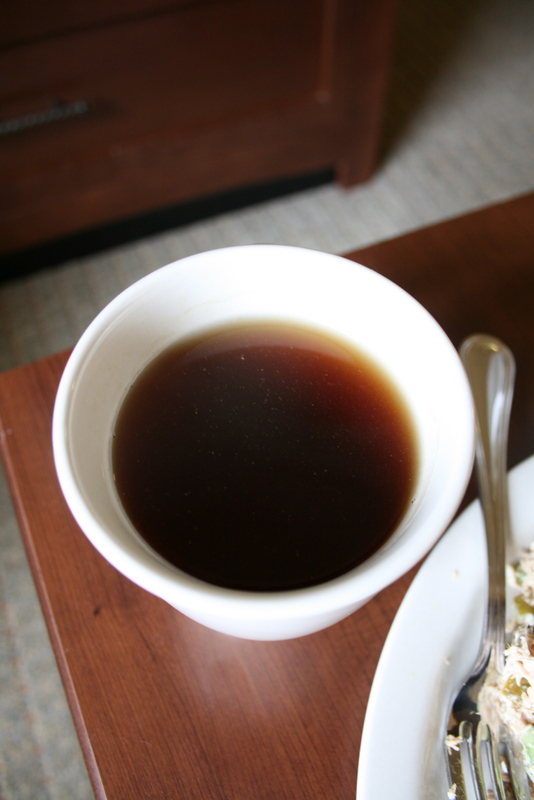 I usually just do a half-cup by itself or with fruit or granola. I cannot recommend it enough. 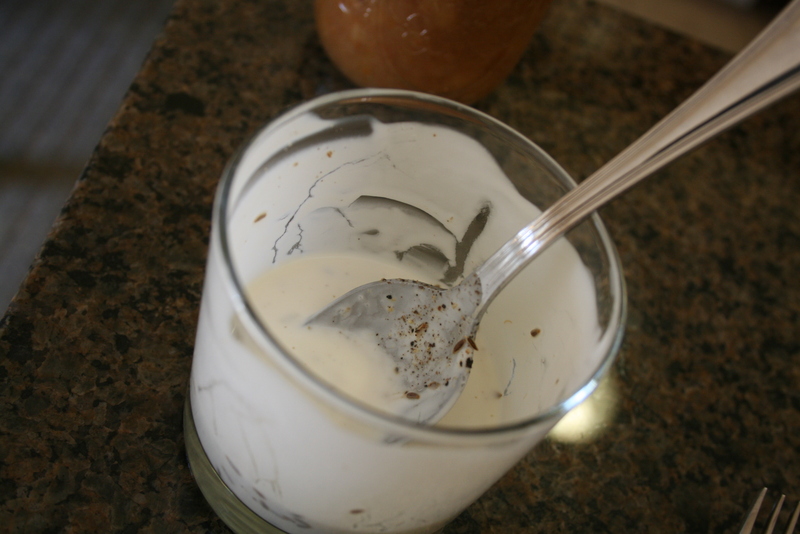 It’s basically a tangier, drinkable yogurt that’s packed with probiotics, the good bacteria found in yogurt. It helps with digestion. For those who grew up on, or still eat, yogurts like Dannon Fruit-on-the-Bottom, it will take a lot of getting used to. I stay away from a lot of the yogurt cups because they are basically just sugar. I once heard a dietician on the radio say that one of those flavored yogurts usually has the same amount of sugar as ICE CREAM. Seriously. Who needs that much extra sugar in the morning? So, I switched to plain and haven’t gone back. Hey, this is a pretty decent picture! Remember that chocolate from yesterday? I never ate it…those veggies and hummus were filling! It made a reappearance on the plate today, but alas, it’s STILL here! It’s currently sitting on the counter, all by it’s lonesome. I felt full after I finished everything else. Those are probably the biggest two challenge for me: NOTICING when I’m getting full, and STOPPING. All too often I load my plate (even with healthy things) and then switch to auto-pilot and finish it all off. Listen to your tummy, Holly! 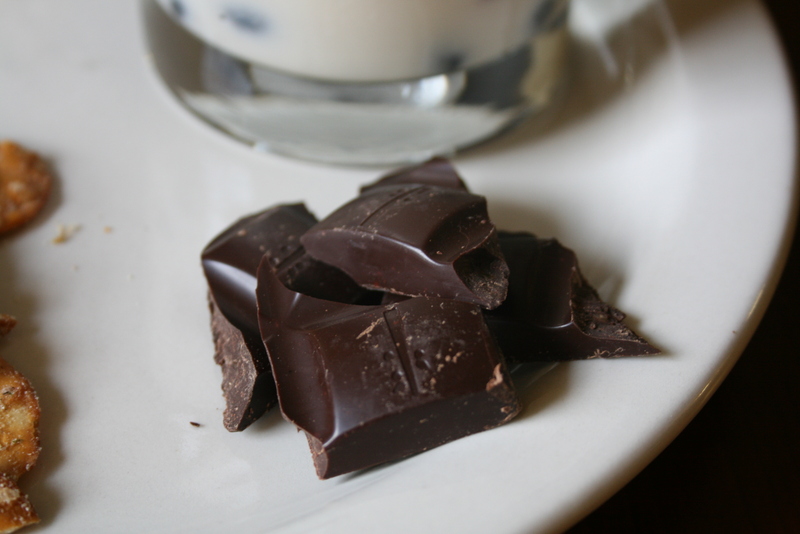 I’m thinking the chocolate might get eaten with some hot, decaf coffee today as an afternoon pick-me-up since I blasted more than 900 calories this morning! First, an hour of pilates, then an hour of crazy hard kickboxing, then an impromptu one-mile run with Hadrian. Whew! So, this post was all about my lunch and thoughts… Hope it helps anyone out there looking to eat real food you can feel good about. 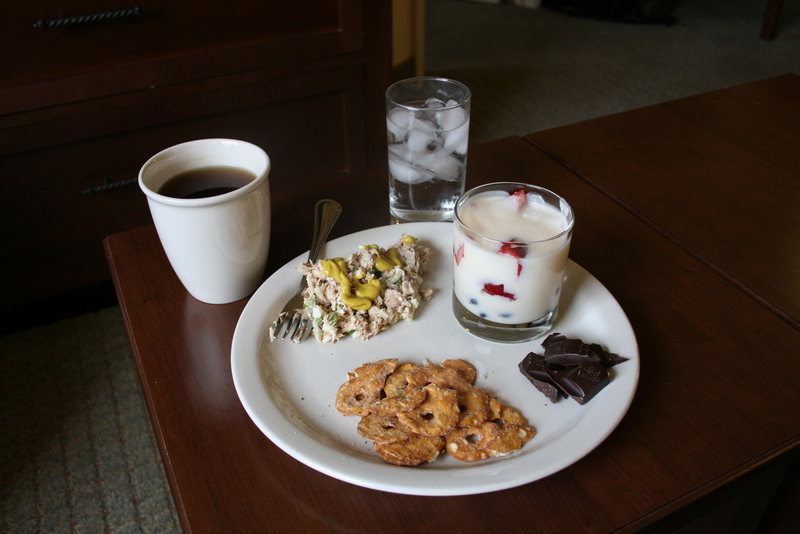 Yesterday was hummus, veggies and dried fruit, today was tuna, pretzels, fruit and yogurt. If you keep stashes of good things, like cheese sticks, fruit, veggies, healthy dips, yogurt and smart splurges (like good chocolate! 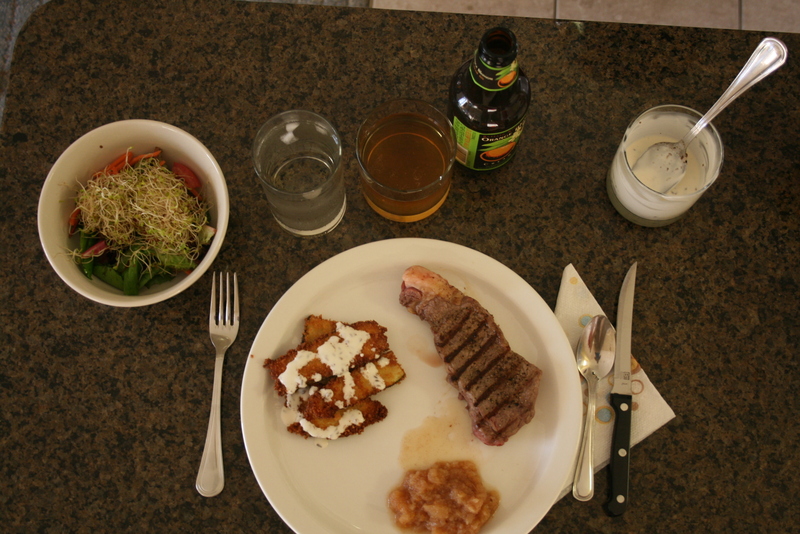 ), you’ll always be able to mix and match different things for nutritious meals.